My studio had gotten a little out of hand, so this morning I had to stop and straighten everything up a little. Now I’m ready to do battle again. There’s always a studio dog! 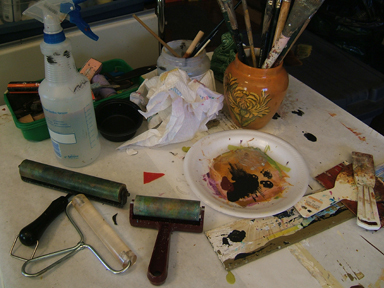 Some tools of the trade — brayers, cheap knives, mat board squeegees. I didn’t find my good knife until after this picture. Plus some shots of my table top, which is covered with freezer paper, taped down, shiny side up. 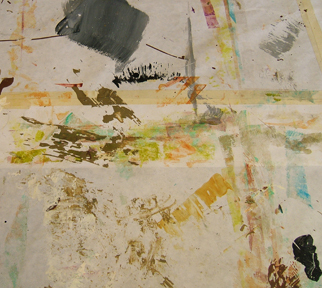 When I want to clean a brush or a knife or a squeegee, I just deposit the paint onto the freezer paper. 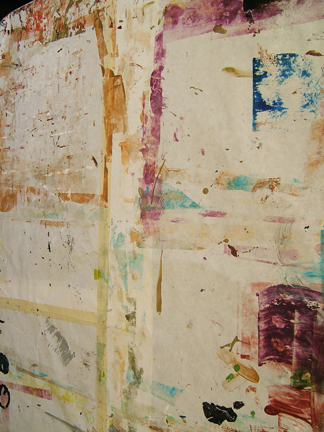 Some day I’ll transfer some of these paint passages onto canvas or a board. I feel better now. Back to painting! 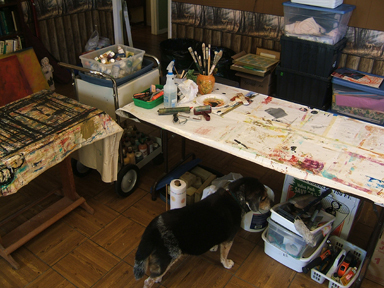 How lovely to get a glimpse into your studio Martha. Thank you, Rosy! We’ve just recently moved in. It still has brown walls from the previous resident, plus if you look closely, there is a deer-in-the-woods border. He was a deer hunter, and there were . . . gasp! . . . deer heads all over the walls. But once we got moved in, it was time for me to get started on a huge painting project, so I still haven’t painted the walls. Otherwise, things are just peachy in there. I love it. Ah, Chris! I should have, really. A dose of inspiration for me today – thank you! Very nice! Do you use matte medium to transfer the off-loaded paint? Great question, Judi! I have had good success just smearing a nice even heavy coat of self-leveling clear gel over the area and leaving that to dry for a couple of days before peeling it off. You then get a nice sheet of clear gel with the paint embedded in the underside. So much fun! I always feel privileged and honored when other artists trust the viewers enough to share the intimacy of their work spaces. 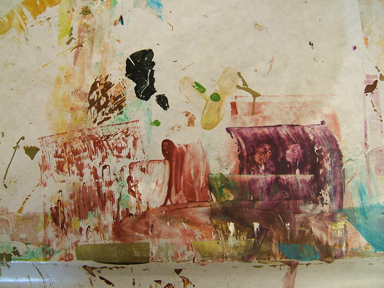 I often have used the work papers I lay out on my work tables in assemblages and book pages. You seem to move easily into various mediums as you allow the paintings to dry. I have to be honest I had been fascinated by paint skins…I did not know what they were called then… but I so love watching vicariously how your paintings become visible to my less experienced eyes. Thank you once again for sharing with me. Imagine and Live in Peace, Mary Helen Fernandez Stewart Art Saves Lives!!! Mary Helen, I also would like to spread out some paper for messing up on purpose. That would be great to have for just the same purpose you’ve mentioned. 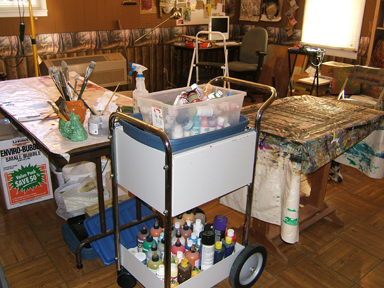 I love seeing other artists’ studios too. I may be wrong, but I suspect your studio assistant was trying to sniff out anything edible! So nice to have company while you work. The studio’s looking good, it must make it such a pleasure to work in. I feel very blessed to have this space to work in. It feels very good.